At HubSpot, we put a lot of thought into how we express our vision: help millions of organizations grow better. There’s a lot packed into those six words. It’s a reminder to us, for example, that our job isn’t to just ship software, it’s to help our customers, with a platform, a philosophy of how to grow, and with our people who are dedicated to customer success. It also serves as a reminder of how we want to grow as a company ourselves — we don’t want to simply grow bigger and more profitable; we want to grow better. That’s where our efforts around diversity and inclusion fit squarely in our mission. Wow, that hit me hard, because it reminded me of an experience I had as an 8 or 9-year old kid growing up in Louisiana. I grew up in an era when there was court-ordered “busing” for elementary schools, because the schools were de-facto segregated based on neighborhoods. So I had two very good friends — one was my neighbor down the street (a white boy like me), and one was the son of one of the bus driver — a black boy who rode the bus his Dad drove into our neighborhood school. Many days, I used to ride the bus home with him and hang out with his family for dinner until my parents came and got me at the end of the day. He lived way out in the country so it was a lot of fun. But one day, I was playing with my friend down the street, and HIS Dad came in and saw us playing. His Dad said to me, “I see you playing with that bus driver’s son — you gotta stop that, we don’t play with those kind of people.” And he used a word to describe those kind of people that was all-too-common but still a shock to hear. As a little kid, I didn’t really know how to handle this, and I didn’t understand it. I told my parents what had happened, and they were very quick to help me understand it for what it was — racism. I felt awful because I thought I should have stepped in for my friend. I also vowed to my nine-year-old self that I will never ever tolerate racism or bias. For me, it’s a plain and simple matter of doing the right thing. So when I heard that feedback from a leader I really respect, I knew — we all did, actually — that while we had made a lot of positive changes company-wide, it wasn’t yet enough. My nine-year-old self would be disappointed. 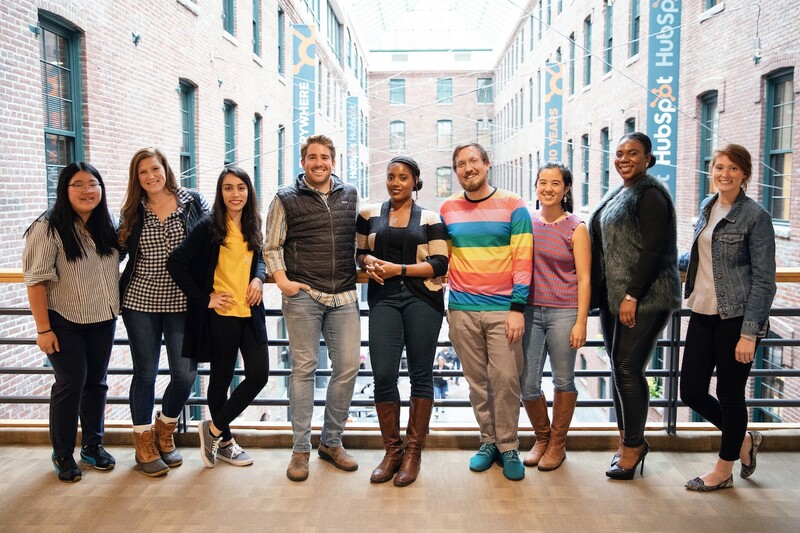 We needed to make diversity, inclusion, and belonging a much bigger part of our entire operating system, so all of our employees, candidates and their families know that HubSpot is a great place to work, truly for everyone. Some people might say this is a hard challenge to solve: both our industry (tech) and our headquarters (Boston) have their share of challenges as it relates to diversity and inclusion. But we’ve built a company by solving for humans, and by rethinking and rebuilding what growing better can look like — our work on diversity, inclusion, and belonging is no different. We started with one major change. We have a very important document in our company called an MSPOT (which stands for mission, serving, plays, omissions, and targets), and we obsess about that document and use it to align the company around the “plays” necessary to achieve our mission. The plays are about what products we build, how we’ll take them to market, and how we’ll support our customers once they’re using our software. Where was diversity and inclusion on this document? Maybe it was in there implicitly, but it was sure hard to find. So this year, we added an explicit “play” to our MSPOT to get us truly focused on this important priority. I think it’s working. You’re never done with initiatives like this, but we’ve made progress at a more rapid rate, and along the way, we learned some valuable lessons from both what worked and what didn’t, three of which I’ve outlined below. Diversity and inclusion is everyone’s job: At HubSpot, we give employees a lot of autonomy, and for the first few years as we worked on diversity and inclusion, we asked folks to prioritize it as part of their jobs. But our folks are busy! So the result was that it often became an afterthought compared to other business priorities. Adding diversity and inclusion as a play to our MSPOT, along with explicit goals, really changed that for us. We’ve made it clear to our employees that getting meaningfully better on diversity and inclusion isn’t just the job of our recruitment team or a single part of the organization: it’s something all of us (including me) need to build into our daily operating system and principles, so we started setting the tone at the top that this is a business imperative. The “Why” Really Matters: In rolling out the MSPOT to HubSpot globally, one thing we could have done a better job on was articulating “why” diversity and inclusion was added to the MSPOT and why it matters to each of us personally on the leadership team. Because we weren’t crystal clear on why we were prioritizing diversity and inclusion in the rollout, we left our employees confused as to whether we were doing this as a reactive measure (in response to internal criticism we hadn’t done enough) or because we truly cared about this issue. The lesson for me was that, on matters of diversity, inclusion, and belonging, it’s not just what you do and who you hire that matters, it’s why your company and leaders care about this issue that carries the day. After seeing and hearing some confusion on this front, I sent a note out to all of our leaders at HubSpot articulating why we are prioritizing diversity and inclusion and the role I expect them to play in prioritizing our collective goal within their respective teams. One issue that needed to be clarified was how our leaders should think about trying to become more diverse in our hiring. Did this mean we should try and find only diverse candidates rather than the “best” candidate for the job? I actually heard this very question a couple of times, and it made me scratch my head because it seemed obvious to me that if we’re not hiring the best candidate for a job at HubSpot we are doing something very wrong. The issue that we’re addressing with this initiative is that we’re potentially missing out on entire groups of potentially great candidates, which is going to be a real problem for us as we continue to grow! In the old marketing parlance, we’re trying to “widen the funnel” of talented folks we can bring into the business, and people who will have a broad range of perspectives and experiences. And we’re working to create an environment where anybody can thrive and be able to do their best work. Clarifying the “why” helped our team understand what we were trying to accomplish — we want to be the best place to work for ALL of our employees, not just subsets or certain groups. I think that clarity has helped us execute much better. It’s About What You Do, Not Just What You Say: Another lesson we’ve learned is that the proof is really in what you do, not what you say. To hold ourselves accountable, we added a series of commitments as a leadership team, including deep partnerships with recruiting, hiring a director of diversity, inclusion, and belonging, expanding executive sponsorships or our employee resource groups, and a monthly meeting of a group of cross-functional leaders across the business on progress and actions items to drive our initiatives. Part of the role I play is making sure that we really match our intention with action, results, and reflection. Just as we do with other core elements of our strategy and execution, we measure progress, get feedback on what’s working and what isn’t, and lean into things that are creating impact for our employees and our candidates. In parallel, we need to ensure we are learning from other organizations and leaders on what we can do better, so I’ve started to spend more time learning from folks outside of HubSpot on ideas that are working for other high-performing teams and companies we admire. I love coming to work every day. We have a great team, and they are really good at executing on hard things. Whether it’s launching a new product, opening a new office, or adapting to customer feedback, we are true to our mission of helping companies grow better. I’m not ready to call our diversity, inclusion and belonging strategy a success yet because we still have a lot of work to do to, but I can say with certainty we’ve learned some key lessons along the way to apply to our path forward. Creating a company that our kids and grandkids will be proud of means making sure that our company is a best place to work for everyone. That’s hard — the world of tech is mired with a tough reputation and history as it pertains to diversity, inclusion, and belonging. But one of the reasons I work in tech is because we’re good at finding breakthrough solutions to entrenched problems in society and the world. It’s an exciting opportunity, and one I’m energized to be a part of at HubSpot.